This cover was mailed from Mombasa. Mombasa is a port city on the Indian Ocean coast of Africa at about 4° S.
The postmark is a double rim CDS. The sender marked the cover for LATE FEE BOX . The cover received a handstamp: POSTED IN LATE FEE BOX. 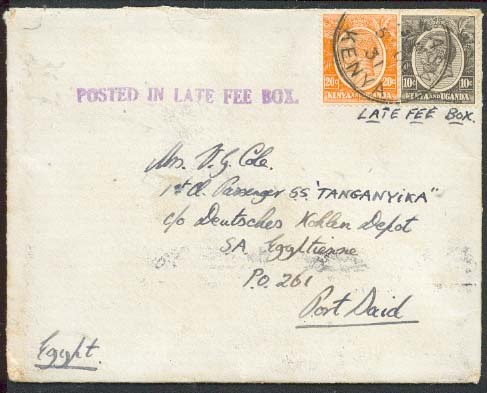 The late fee was paid for special handling of mail posted after regular mails were closed. In this case, it was probably to catch an outbound ship bound for Suez. The cover was addressed to a 1st class passenger on the Steam Ship Tanganyika [sic]. The letter was sent c/o the German Coaling Depot in Port Said. 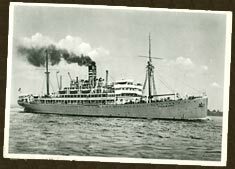 The Tanganjika was owned by the German East Africa Line from 1922 to 1935. It was built in 1922 by Blohm & Voss, Hamburg. one funnel, two masts, single screw and a speed of 14 knots. She could carry 449 passengers and had a crew of 154. One of the ports on their routes to ports in the Indian Ocean and the orient was in Port Said, Egypt. George V 10c green and 20c bright orange (SG 79 and 83a).